An experiment conducted in Kenya by Lucy King of the University of Oxford has shown that elephants are afraid of bees. So afraid, in fact, that they make a specific sound to warn other elephants that there are bees nearby. By playing a recording of the sounds of bees, or even of the sound that elephants make that means "bees," a herd of elephants will take off running. This could be a useful tool for farmers in Africa whose crops are subject to raids by elephants. Installing beehives around human settlements has been proven to work to keep elephants away. 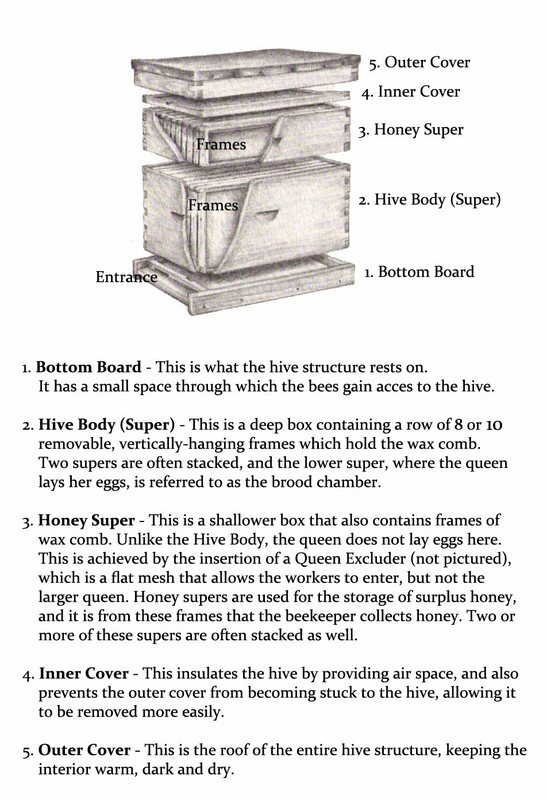 Honeybees are considered to possess the most complex communication system, aside from primates, in the natural world. The discovery of their "dance language" was recognized as the first clear example of a non-human system that offers an abstract representation of the real world. It has been shown that the more vigorously a bee "waggles" during this sharing of information, the more attractive the food source. Inferior food sources inspire less energetic waggling. How does a "dancer" attract an audience from among 50,000 bees in the near-total darkness of the hive? Experiments have proven that specific areas on the comb are assigned as "dance floors" with pheromone markers, so that bees within the hive know exactly where to go to find foragers who have discovered a desirable food source. In addition, a dancing bee attracts attention from others nearby through the vibrations carried by the comb structure itself. When they feel the comb vibrating under their feet, bees know that someone is communicating directions, and they need simply to go to the predesignated dance area on the comb to find the dancer and receive those instructions. In this video, the bees surrounding the dancer are using their antennae to track the dancer's movements. After following the dance for a few cycles, they can figure out both the direction and the distance they need to fly in order to find the newly-discovered food source. If you're planting a garden this spring, why not make it one the bees will enjoy as much as you do? Bee gardens, as you have no doubt surmised, feature flowers that attract bees. Honeybees (Apis mellifera) are just one of about 3,500 species of bees in North America, almost all of which are pollinators. Other notable species include bumblebees, orchard mason bees, digger bees, carpenter bees and cuckoo bees, to name only a few. Bees visit flowers to harvest nectar and pollen, both of which they use for food: nectar sustains the bees on their foraging flights to and from the hive, and pollen is collected and stored in the hive to feed the larvae. Pollination occurs incidentally, when pollen from one flower clings to the hairs covering the bees' bodies, and is transferred to the next flowers visited - resulting in more plants with more flowers. The garden benefits from this free pollination, the bees benefit from more flowers with more nectar and pollen, and gardeners (and farmers) benefit from increased yield. The disadvantages? None. In light of the alarming decline of the bees' population in recent years, planting a bee garden is a small but invaluable step that anyone can take in order to ensure that bees can continue their vital contribution to the ecosystem as a whole. While bee gardens aren't a solution to the bees' population crisis, they do offer much-needed help to our often-overlooked partners in survival, who assist so much and ask so little. And every little bit counts. 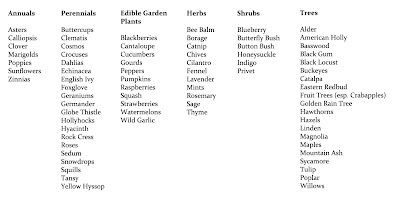 Click the pic above to enlarge a short list of plants that are guaranteed to attract bees. This list represents only a small fraction of the plants that bees love to visit, but it may give you some ideas. And if you keep your eyes open, there's a good chance you'll see some types of bees you've never noticed before. Ideally, it's best to use flowering plants that are native to your area, so as to encourage established colonies of local bee species. Took a trip out to Vinland Valley Nursery this afternoon. 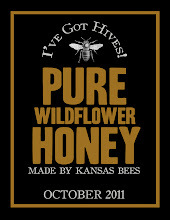 The proprietors, Doug and Amy, have generously donated a small piece of their property for my hive. It's virtually ideal: a nice, out-of-the-way clearing with a southern exposure, and only about a hundred yards from the nursery itself. 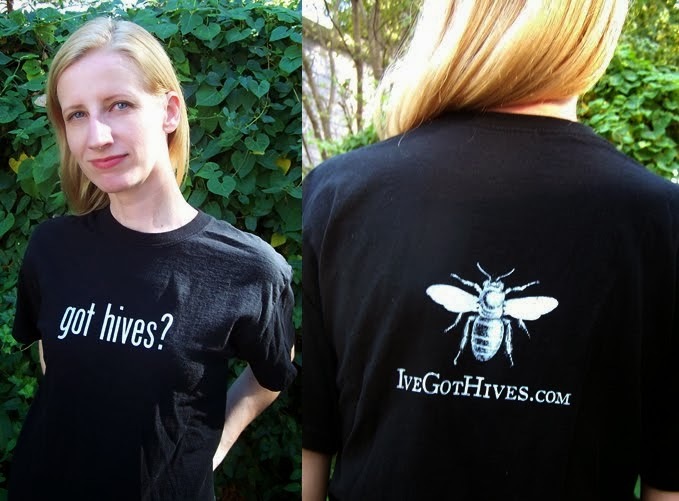 The bees will be happy, the plants will be happy, and I'm happy that the project is moving forward. 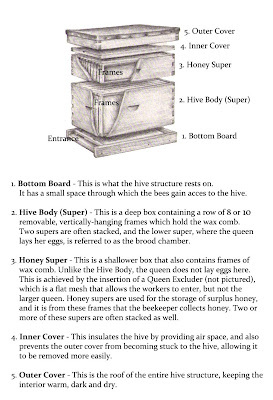 What you see here is the lower hive body (the brood chamber), covered by the outer cover and resting on the bottom board, all atop four cinderblocks. The entrance is blocked with an unpainted dowel, to ensure that no other bees (or anything else) decide to take up residence inside. It's empty for now, but the bees should arrive in about a month (hopefully earlier). More pics, and video, coming soon! The lady behind the camera is my queen, the beautiful Ginny. The standard hive used by apiculturists was invented in 1851 by Lorenzo Langstroth of Philadelphia, and because of the simplicity, practicality, and efficiency of its design, it has remained fundamentally unchanged to this day. Click the pic to enlarge.